Preheat the oven to 200°C/400°F/gas 6. Put 1 chicken breast, with its skin left on, in a bowl. Deseed and slice up half a fresh red chilli and add to the bowl with the leaves from a couple of sprigs of fresh marjoram or oregano and a pinch of sea salt and freshly ground black pepper. Toss together. Very carefully cut a medium butternut squash into quarters. Remove the seeds and slice one quarter of the squash as finely as you can. 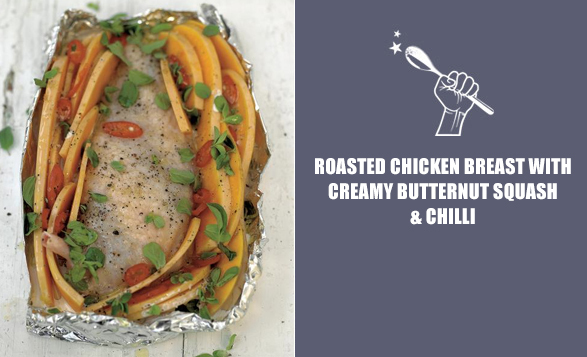 Place the chicken breast and flavourings from the bowl into the tray and snugly fit your squash slices around the chicken. Carefully pour a little single cream around the squash (not on the chicken). Season with grated nutmeg and salt and pepper then drizzle with some olive oil and cook in the middle of the oven for 25 to 35 minutes.